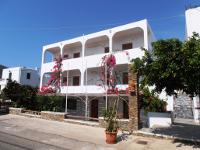 Benakis Hotel, a C’ class hotel, fully renovated in 2010, located in Platy Yialos, 30 m. from the beach. Restaurants, shops and bus stop: nearby. 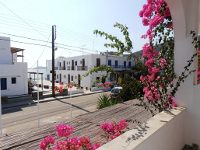 All rooms (30 units) air-conditioning, TV, telephone, mini fridge, hair dryer, and veranda or balcony with sea view or mountain view. Facilities of the hotels include: reception, breakfast lounge, cafe/pastry shop and Satellite TV room. Free Wi-Fi Internet accessible from the Reception and lounge areas.